Synonyms and Other Names: Colossoma nigripinne (Cope 1878), C. oculus (Cope 1872); pacu. Identification: Machado-Allison (1982) revised the group and provided information for identification. Many synonyms exist; C. oculus and C. nigripinne are junior synonyms commonly used in the aquarium literature and in past reports on United States nonindigenous fishes. Colossoma taken in United States waters also have been misidentified as red piranhas Pygocentrus nattereri or as one of the other pacus: red-bellied pacu Piaractus brachypomus or small-scaled pacu Piaractus mesopotamicus. Species descriptions provided by Machado-Allison (1982) and Britski (1977). For photographs, see Géry (1977, p. 255, misidentified as C. brachypomum = Piaractus brachypomus), Goulding (1980), Machado-Allison (1982), and Araujo-Lima and Goulding (1997). Ruiz-Carus and Davis (2003) presented diagnostic characteristics to distinguish this genus from the similar genus, Piaractus. Native Range: Tropical America. Native to the Amazon and Orinoco river basins of South America (Machado-Allison 1982; Araujo-Lima and Goulding 1997). Table 1. States with nonindigenous occurrences, the earliest and latest observations in each state, and the tally and names of HUCs with observations†. Names and dates are hyperlinked to their relevant specimen records. The list of references for all nonindigenous occurrences of Colossoma macropomum are found here. 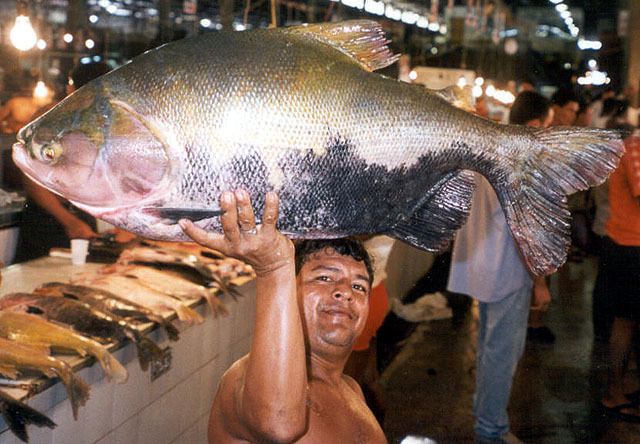 Ecology: Colossoma macropomum is the second largest scaled fish in the Amazon River basin. Tambaqui are omnivorous, and possess a unique combination of molariform teeth and elongated gillrakers that allow exploitation of both nuts/seeds and zooplankton as food resources (Goulding and Carvalho 1982). Tambaqui migrate seasonally between whitewater rivers and inundated floodplain forests during low and high water periods, respectively. Spawning occurs in whitewater rivers during the beginning of the high water season, with larval and immature fishes entering floodplain forests and lakes (Goulding and Carvalho 1982). Means of Introduction: All introductions were probably aquarium releases. Status: Possibly established in Puerto Rico. Reported, but failed, in California, Florida, Hawaii, Massachusetts, Nebraska, and Texas. Remarks: Pacus are popular as aquarium fish. They are esteemed as food fish in South America, with large fisheries based around seasonal spawning movements and aggregations (Goulding and Carvalho 1982). Most U.S. records represent collections of single fish taken by anglers. The Massachusetts fish was originally reported to be a red-bellied pacu in a newspaper account and as a Colossoma sp. by Cardoza et al. (1993); the fish was later determined to be C. macropomum by W. Fink, based on a photograph of the specimen (Hartel, personal communication). Some specimens previously identified as C. macropomum and taken in Florida waters may very well represent hybrid forms produced by artificial means using Colossoma and Piaractus parents (L.G. Nico, personal observations). Voucher specimens: California (CAS 76474; SBMNH 1460); Florida (UF 65748, 97061, 119599); Florida (UF 65748, 96235, 97061, 116291, 119599); Mississippi (MMNS 31259); Oregon (OS 13217); Washington (UW 025858). Araujo-Lima, C., and M. Goulding. 1997. So fruitful a fish: conservation biology of the Amazon's tambaqui. Columbia University Press, New York, NY. Brittan, M.R., and G.D. Grossman. 1979. A pacu (Colossoma, family Characidae) caught in the Sacramento River. California Fish and Game 65(3):170-173. Hartel, K. Ichthyology Department, Museum of Comparative Zoology, Harvard University, Cambridge, MA. Hartel, K.E., D.B. Halliwell, and A.E. Launer. 1996. An annotated working list of the inland fishes of Massachusetts, University of Massachusetts, Cambridge, MA. http://www.mcz.harvard.edu/fish/ma_fam.htm. Page accessed March 5, 1998. Howells, R.G., R.L. Benefield, and J.M. Mambretti. 1991. Records of pacus (Colossoma spp.) and piranhas (Serrasalmus spp.) in Texas. Texas Parks and Wildlife, Management Data Series 70, Austin, TX. Lindsey, S. 2010. Outdoor life: at least if wasn't a piranha. The News Herald. http://www.newsherald.com/articles/tambaqui-85836-doubtful-fish.html. Created on 08/02/2010. Accessed on 08/10/2010. Logan, D. Department of Fisheries and Wildlife, Oregon State University, Corvallis, OR. Ross, S.T. 2001. The inland fishes of Mississippi. University Press of Mississippi, Jackson, MS.